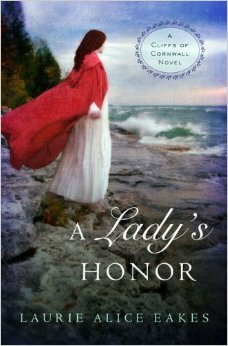 Society is concerned about her honor, but Elizabeth must realize her worth doesn't lie in her inheritance. In order to avoid a forced marriage to a dangerous man, Elizabeth Trelawney flees London. An unexpected stranger arrives to help her, and as they elude her pursuers across Cornwall in the night, Elizabeth realizes her rescuer, Rouan Curnow, is familiar. Their differences in social status kept Rouan from pursuing a courtship with the lady his heart wouldn't let him forget. Now because of dangerous smugglers and local murders, the two are plunged into a reckless alliance that rattles Rouan's fledgling faith in God. The closer they get to Bastian Point-Elizabeth's true home-the more she realizes it is the only place she longs to be. Even the sight of its solid structure perched on the cliffs makes her feel safe. Elizabeth is the most likely to inherit Bastian Point if Grandfather never learns she spent the night, however innocently, with a near stranger. As spring warms into summer, Elizabeth finds herself torn between wanting to be the perfect grandchild and her growing love for a man of whom no one will approve as a match for her, a man she knows she shouldn't entirely trust. Unsure whether she is being foolish or following the right path, she sets out with Rouan on a quest to find the true culprit behind the local violence. To be honest this was a very disappointing read. The first few chapters were intriguing but as the story continued on it was difficult for me to really get into the story. Elizabeth (the main character) was not my favorite, her attitude and how the characters interacted I did not enjoy. I wish I could say otherwise but this is my honest opinion. I had high hopes and the first part of the book is great with mystery but the story line was not as well developed as I would have liked. Look for this book in stores April 22, 2014. "I received this book from BookLook for free in exchange for an honest review."